The 79 acres are being graded at 10010 W. Geiger Blvd. in preparation for utility work, when the site’s underlying infrastructure will be installed. A permit for that work is pending with the county. 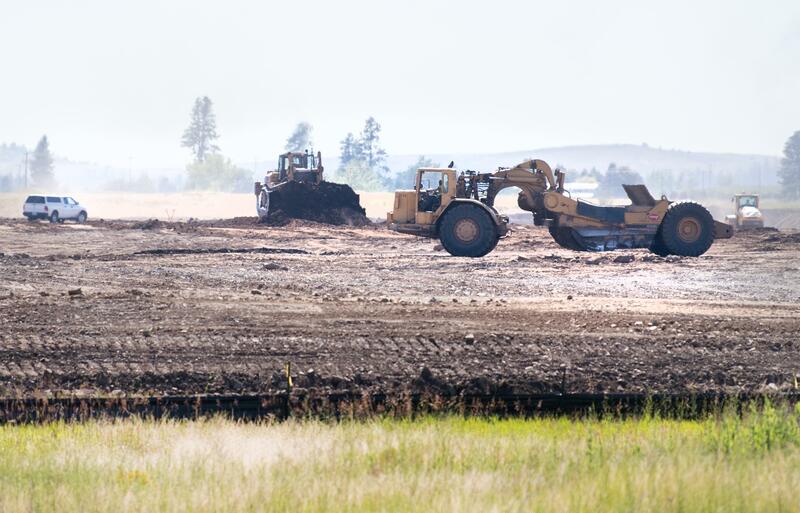 “It’s quite a large site so there’s quite a bit of dirt to move around,” said Randy Vissia, Spokane County’s building and code enforcement director. Though information about the site’s eventual tenant is sparse, according to documents filed with the state, the primary structure will have a footprint of 639,000 square feet and encompass more than 2.5 million square feet over four stories. Permits filed with the county describe a three-story building. A traffic analysis for the project shows the building will house upward of 2,288 employees, with a seasonal peak of 2,963 during November and December. The analysis states that “completion and full occupancy” for the project is forecast for fall 2019. Despite widespread rumors the structure will be an Amazon fulfillment center, Vissia said he didn’t know the identity of the tenant. Even if he did, Vissia said he couldn’t disclose the name because of a nondisclosure agreement. He said it was up to the company when it would reveal its identity and said that revelation could be delayed until directly before it begins operation. Regardless, Vissia estimated construction would begin on the structure before the winter. The rough grading permit was issued to Coffman Engineers, of Spokane. – N.D. Banner Bank is planning a commercial mixed-use development on the northeast corner of Argonne Road and Sprague Avenue in Spokane Valley. Plans call for five buildings totaling more than 25,000 square feet that will include a bank, pharmacy, coffee shop and two fast food restaurants with more than 82 parking spaces, according to documents filed with the city. The architect for the project is Spokane-based Bernardo|Willis Architects. Tenants have yet to be announced. Walla Walla-based Banner Bank has 10 branches in Spokane with more than 200 locations in Washington, Oregon, California and Idaho. – A.E. Spokane Exercise Equipment is moving into the first-floor retail space of the Parkade in the location held by Sport Town for 27 years, according to Dru Hieber, Parkade Inc. president. The move for Spokane Exercise equipment isn’t a big one, as it’s located not even a block from its current spot in the former Huppin’s building, 425 W. Main Ave. Its new address will be 511 W. Main. The move will allow the store’s owner, Patti Pettigrew, to showcase all of her equipment. Hieber said the exercise equipment store should be open in August. In 2014, Pettigrew moved her store out of the Bennett Block, which is owned by Hieber. The move was partly precipitated by Hieber’s plans to renovate the historic block. With that work complete, the Bennett Block space now houses a Carhartt store. Steve Warwick, the owner of Sport Town, decided to close his store when he heard about the arrival of the Nike outlet store in The M building, which is the former Macy’s building. He opened the Parkade location in 1991. Warwick, who is running a sale to clear his Spokane merchandise, still has a Sport Town and adjoining fitness center in Colfax, where he lives. – N.D. Published: July 15, 2018, 6 a.m.